Pittsburgh, PA: It was a hockey night in Pittsburgh with a Metropolitan Division game pitting the New Jersey Devils (4-3-2) versus the Pittsburgh Penguins (5-2-1). This was the first regular season, divisional matchup between the two teams since the exit of longtime Devils’ netminder, Martin Brodeur. Brodeur had a storied career with New Jersey from 1990-2014, and is now a free agent, after decades with the Devils organization. Nine seconds from the start, the first goal of the game was notched by New Jersey’s left winger Dainius Zubris, along with the help of Travis Zajac and Jaromir Jagr. Pittsburgh’s tying goal began with an Evgeni Malkin face-off win and subsequent defensive mishaps by the Devils. 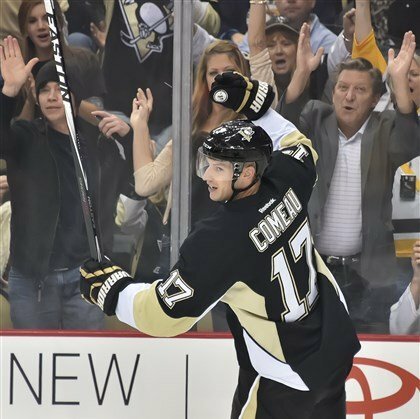 The Penguins were quick to take advantage of goaltender Cory Schneider’s puck handling issues; with pressure from Pascal Dupuis, Schneider was caught out of the net and Pittsburgh’s Blake Comeau capitalized by backhanding the puck into the net to tie the game at 1. The Devils were once again unlucky when a Zajac shot bounced off the left post, behind Penguins’ goalie Marc André Fleury at 10:08, resulting in a bit of a scrum around the net. New Jersey went on the man advantage at 13:29, after a holding call on Pittsburgh’s winger Steve Downie. Another Devils’ shot off the post resulted in a defensive surge from the Penguins as time expired and both teams returned to even strength. As a result of a tripping penalty by Pittsburgh’s Simon Despres, the Devils went back on the power play at 18:43. The first period ended with a 5 on 4, but shots were 9 to 8 in favor of the Penguins. With 43 seconds left on the scoreless power play, the Devils were in control to start the second period. Pittsburgh’s Marcel Goc drew a holding penalty seconds later as Devils’ Zajac entered the sin bin. The Penguins’ standard first power play unit with Sidney Crosby, Evgeni Malkin, Patrick Hornqvist, Kris Letang, and Chris Kunitz couldn’t connect. With speed, New Jersey’s Jakob Josefson poke-checked the puck through Malkin’s legs for a breakaway, slid the puck to his backhand and raised the biscuit over the left pad of Marc André Fleury, to make the game 2-1. Later, in a 3 on 3 rush toward the Pittsburgh net, a rebound off the netminder’s pads was tapped in by Tuomo Ruutu making it 3-1 in favor of the Devils. Halfway through the second, the Penguins went back on the power play, after Malkin was held by Devils’ Damien Severson. At 7:21, the Devils were called for Too Many Men on the Ice to send the Penguins up 5 men to 3. With the leading power play in the NHL, it didn’t take long for Pittsburgh to capitalize on the two-man advantage, when Evgeni Malkin scored on a slapshot, bringing the game within 1. After a Devils’ broken stick and turnover in the Penguins’ defensive zone, a quick outlet pass from Simon Despres found Patrick Hornqvist and on the short side of Schneider’s glove hand, the equalizing shot sailed into the net. The game was tied at 3. At the end of an extended Pittsburgh shift, the referee called Craig Adams for boarding at 15:28. The second power play unit for the Devils included Jaromir Jagr, Marek Zidlicky, Damien Brunner, Ryane Clowe, and Patrik Elias. As time expired on the penalty, Pittsburgh’s Craig Adams jumped out of the box, caught a breakaway pass through the neutral zone, curled around the front of the net and buried it over Schneider’s left shoulder. Minutes later at 18:49, Pittsburgh Captain, Sidney Crosby notched goal with assists from Simon Despres and Chris Kunitz, making the score 3-5 in favor of the Penguins. The second period was exceptional hockey, including a short-handed breakaway goal, a 5 on 3 power play goal and a breakaway goal by a player coming directly out of the penalty box. After 40 minutes of play, shots tallied in favor of Pittsburgh, 23-13. As the third period began, Cory Schneider took a seat on the bench to make way for a goaltender change in Scott Clemmensen. 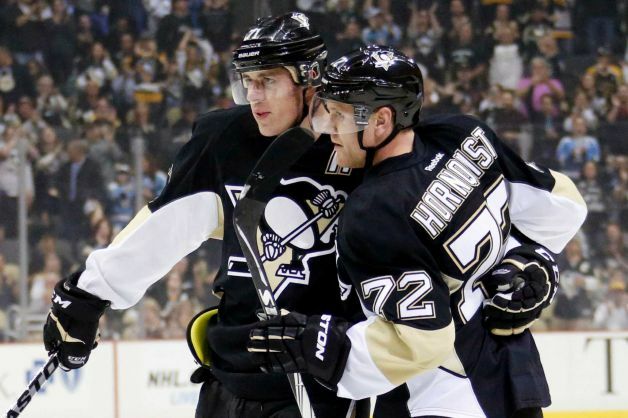 Momentum stayed with Pittsburgh when forward Brandon Sutter drew a hooking penalty in front of New Jersey’s net. New Jersey’s Bryce Salvador headed to the penalty box at 3:41 in the third. At 5:29, on the man advantage, Pascal Dupuis sent a shot flying past the Devils’ goalie to raise the Penguins’ total for the night to 6. New Jersey’s Tuomo Ruuto took a tough penalty after being clobbered by the formidable Penguins’ defenseman, Despres at 6’4”. Ruutu reacted by tripping a Penguins’ forward. After 1:51 expired on the penalty kill for the Devils, another infraction for Too Many Men on the ice instituted a Penguins’ 5 on 3 for the second time in the game. Slapshot after slapshot battered the Devils’ net as time expired on the first of two penalties, but the Penguins weren’t done. 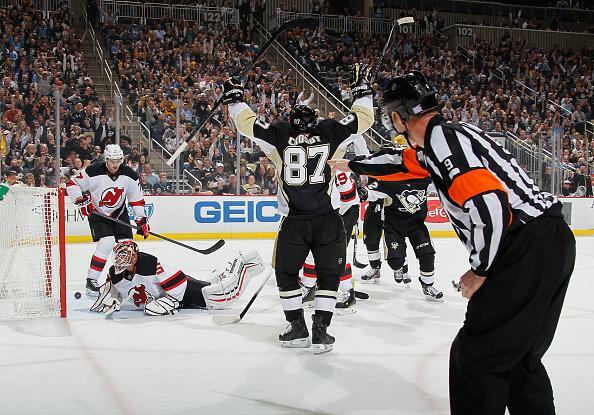 Steve Downie, Penguins forward, wristed a shot past Clemmensen, who allowed a total of 3 goals in the third period. The final nail in the coffin came with a slapper from Sidney Crosby, lifting the total from 7 to 8. Frustration took its toll on the Devils as Pittsburgh went back on yet another power play. Craig Adams and Zach Sill guest starred on the Pens’ power play, something that rarely happens as Adams is one of Pittsburgh’s strongest penalty killers. With this win, the Penguins passed the Devils in the divisional standings. The Penguins played a smart game after a careless giveaway at the beginning, spreading the scoring wealth around to seven different players, showing their balance and ability to score in myriad game situations. Captain Sidney Crosby recorded two goals and leads the team with 14 points. The standout player of the game was Pittsburgh’s defenseman, Simon Despres, who had two assists and shut-down the Devils’ offense after the first period of play. The next meeting between these two teams will take place on 2 December 2014. Final score New Jersey 3, Pittsburgh 8.